This is another walk in Burnley to go with A Walk Between Burnley Barracks And Burnley Manchester Road Stations. Burnley Manchester Road and Burnley Central stations are not that far apart. 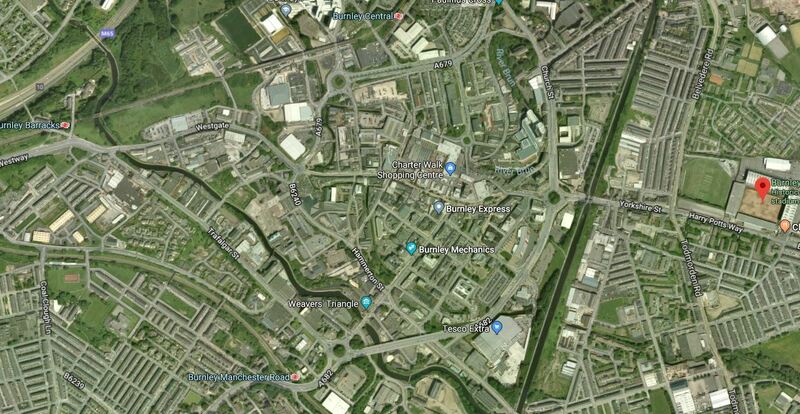 This Google Map shows Burnley’s three stations in relation to the Town Centre and Turf Moor. The various locations are as follows. Turf Moor is indicated by the red arrow in the East. Burnley Barracks station is in the North-West corner. Bunley Central is at the North. Burnley Manchester Road is at the South. The Leeds and Liverpool canal weaves its way through the town passing close to Burnley Barracks station. What the map doesn’t show is the terrain. The main station at Manchester Road is on one stretch of high ground and Central station and Turf Moor are on another. So I walked down the hill from Manchester Road station, through the Shopping Centre and up the hill the other side to Central stion. It was an easy walk down the hill followed by a stiffer one up to Central station. Improvements to the East Lancashire Line. In A Walk Between Burnley Barracks And Burnley Manchester Road Stations, I concluded the post with the following. If new four-car Class 769 trains replace the current two-car scrapyard specials on the East Lancashire Line, the following will happen. Capacity on the route will be doubled. The service will be faster, due to the increased speed and power. No expensive platform lengthening will be required. An hourly service between Blackpool South and Colne will have no problems operating seven days a week. Some stations, like Burnley Barracks, will need improvements to handle the extra passengers. Two trains per hour will need track work to add passing loops and modern signalling, and a few more trains. The big question has to be asked, if stations like the single-platform Burnley Central can handle two trains per hour in both directions. I discussed this in Improving The Train Service Between Rose Grove And Colne Stations and came to the conclusion, it was possible with a passing loop between Burnley and Brierfield stations, modern signalling and Class 769 trains. It could all come together very nwell for the residents of East Lancashire.